Team LightArrow is very excited about our new updates of LifeTopix and My.Agenda. Our new updates include several new features to maximize your productivity at home, at work, and while you’re on the go. Keep reading to learn how you can take advantage of the latest features. We’re super excited about the Shopping topic’s complete redesign. I encourage you to explore this topic and experience the new features for yourself, and I’ll touch on the highlights here. The Shopping topic is now so feature rich, it’s available as a stand-alone app for those who only wish to manage shopping and coupons. You can find the stand-alone app at the Apple App Store (My.Shopping). You’ll first notice the new view of the Shopping topic. It’s redesigned to make it easier to add and view shopping items, shopping lists, things to sell, gifts for others, gifts received, coupons, products, and sellers. You’ll see the shopping items, lists, etc. that are due or coming due in the What Matters Now “ribbon” and items you haven’t purchased yet in the Open Shopping Items “ribbon.” The plus sign makes it easy to add shopping items on the fly from this view. 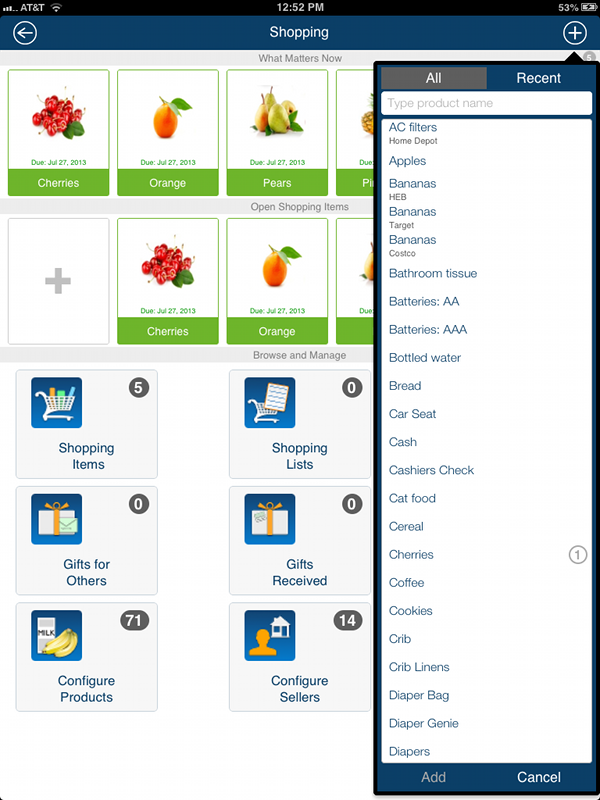 The following image shows the redesigned Shopping view. 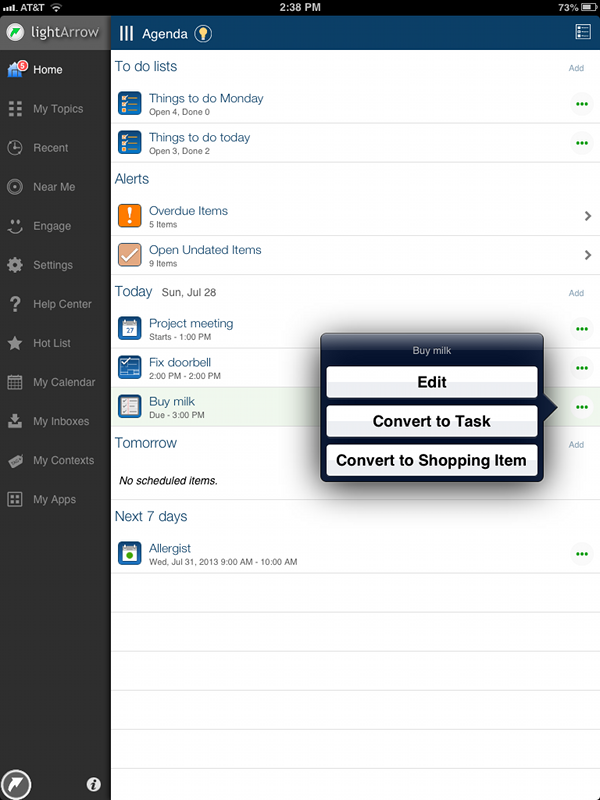 LightArrow apps support multiple shopping lists for those who prefer to manage their shopping into separate lists. For example, you might want to create back-to-school lists, grocery lists, business list items, home improvement items, etc. 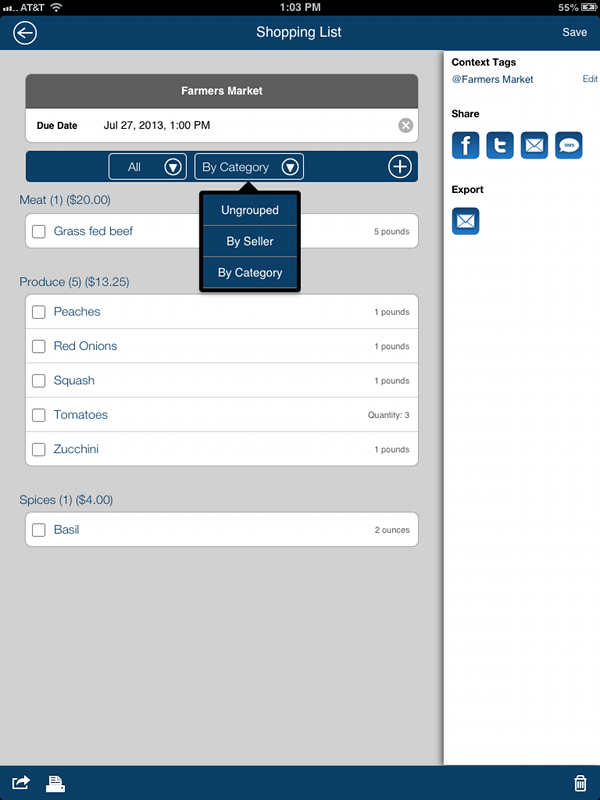 A great feature included with the Shopping list view is the ability to view items by seller or category. The categories you create are completely configurable by you; therefore, you might create categories by grocery aisle, type of grocery item, price level, etc — whatever makes you more productive. You can also view your lists by open or bought items to ensure you’re not returning to the grocery store, office supply store, or mall to pick up the items that you forgot to purchase. Another great Shopping List feature is the ability to share lists via email with a friend, spouse, housemate or partner. They can open a list directly in their LifeTopix or My.Agenda app from their email. Also, if you’ve set up device-to-device sync and both users are sharing the same Dropbox folder for data, you can share and collaborate using the same shopping list. 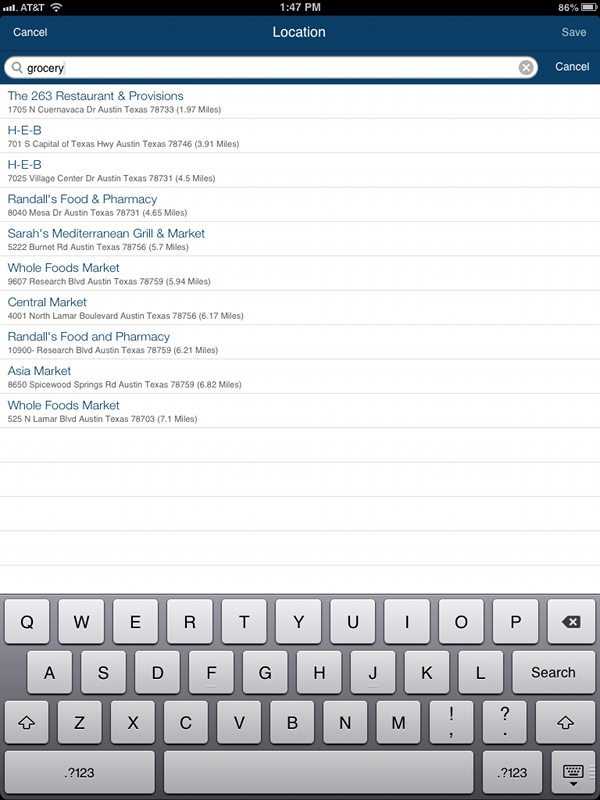 The following image shows the redesigned Shopping List view. Another great addition is how coupons are managed. The coupon management is intended to save you time and money by helping you keep track of coupons and their expiration dates. For stores that allow electronic versions of coupons, you can take photos of the coupons and access them directly from your app. You can take note of your coupons and add an expiration date. When you’ve added a date tag for coupons, you’ll know immediately when they are going to expire because they will appear in the “What Matters Now” section of the Shopping view as well as the Agenda view. The following image shows the redesigned Coupon view. We’re equally excited about the Notes + Files topic’s complete redesign. I encourage you to explore this topic and experience the new features for yourself, and I’ll touch on the highlights here. Notes + Files is now so feature rich, it’s available as a stand-alone app for those who only wish to manage notes, checklists/to-do lists, and online files and notes. You can find the stand-alone apps at the Apple App store (Pro.Notes and My.Notes). You’ll first notice the new view of the Notes + Files topic. 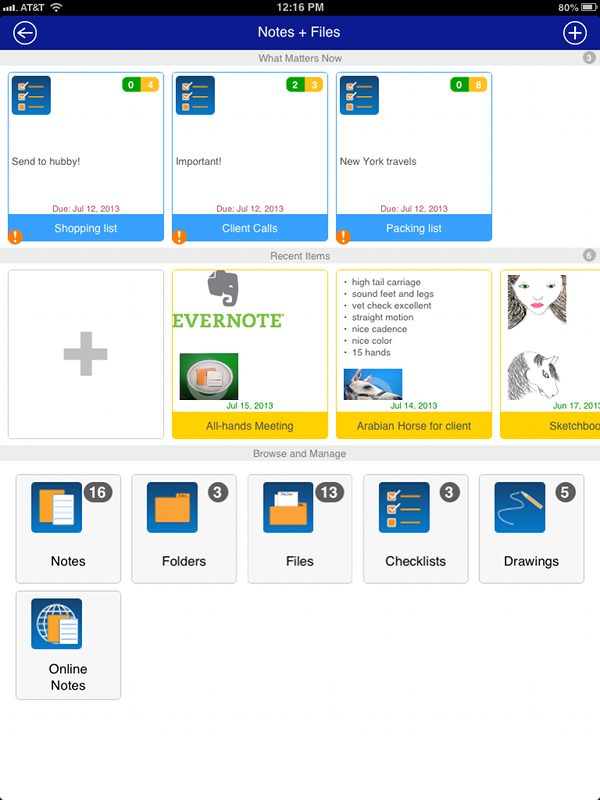 It’s redesigned to make it easier to add and view notes, files, checklists, and drawings. You’ll see the notes and lists that are due or coming due in the What Matters Now “ribbon” and items you recently added or updated in the Recent Items “ribbon.” The plus sign makes it easy to add note items on the fly from this view. The following image shows the redesigned Notes + Files view. 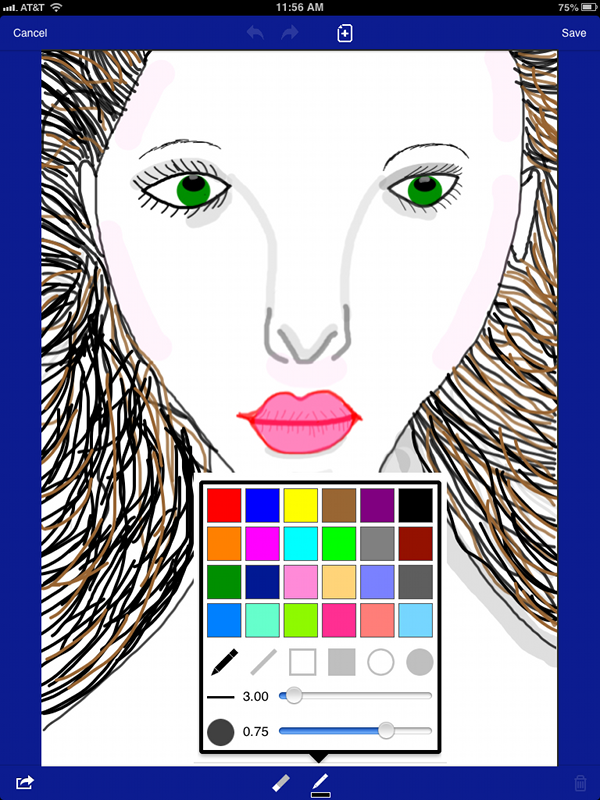 The drawing capabilities in LifeTopix and My.Agenda have spectacular improvements. The drawing tools have been combined into one control, and a landscape view is now available. Drawing tools include 24 beautiful colors with alpha options; linewidth choices; eraser; clear; undo; print; and email capabilities for drawings. Printing is also available for notes and drawings. Users can now share their drawings via Facebook and Twitter directly from the drawing view. The following image shows the redesigned drawing view. If you’re thrilled about the changes to the Shopping topic and the Notes + Files topic, then you’ll also be excited to see the changes to the People + Services topic. People + Services can now be your central portal for finding information about and contacting your friends, family, colleagues, clients, and service providers. You’ll notice that we’ve also updated the view with a “ribbon” showing Recent Items and Groups. 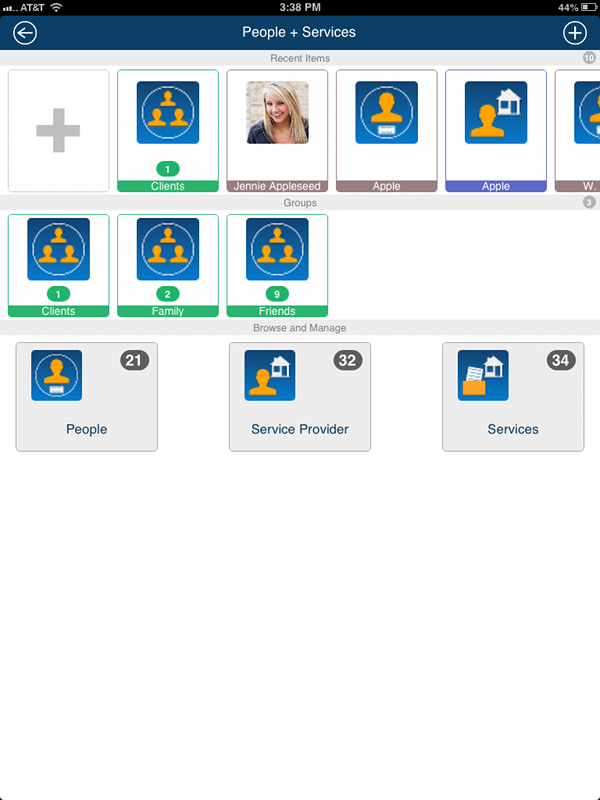 The following image shows the redesigned People + Services view. Imagine the possibilities for keeping in touch with family, clients, friends, and other colleagues. From a central location, you can see their phone number, email address, birthday, anniversary, notes, association with LifeTopix items, and last Twitter and Facebook message for each of your contacts that you’ve set up in LifeTopix or My.Agenda. Instantly, you can send a text message, email, Tweet, or send a Facebook message. You can keep categories — allowing you to easily find your family members, clients, or friends by group. And, as always, the contacts work with your iOS calendar. The following image shows the redesigned Person view. 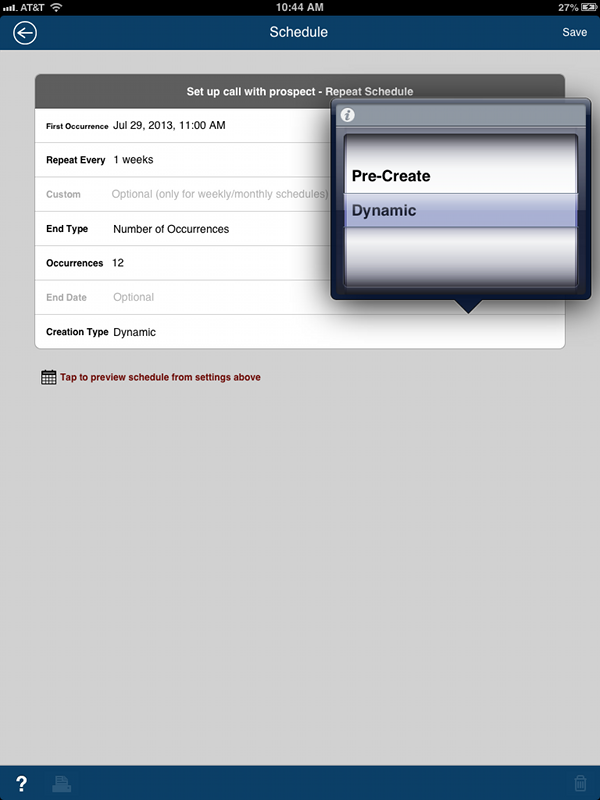 When scheduling tasks, you can now select the option of Dynamic. If you choose this option, each task is only created after the previous task is cancelled or completed. The Pre-Create option creates all the tasks at once. The new option, Dynamic, is very useful for tasks that need to be completed in a pre-defined or designated order. Custom repeat schedules are now available for tasks and appointments (events). 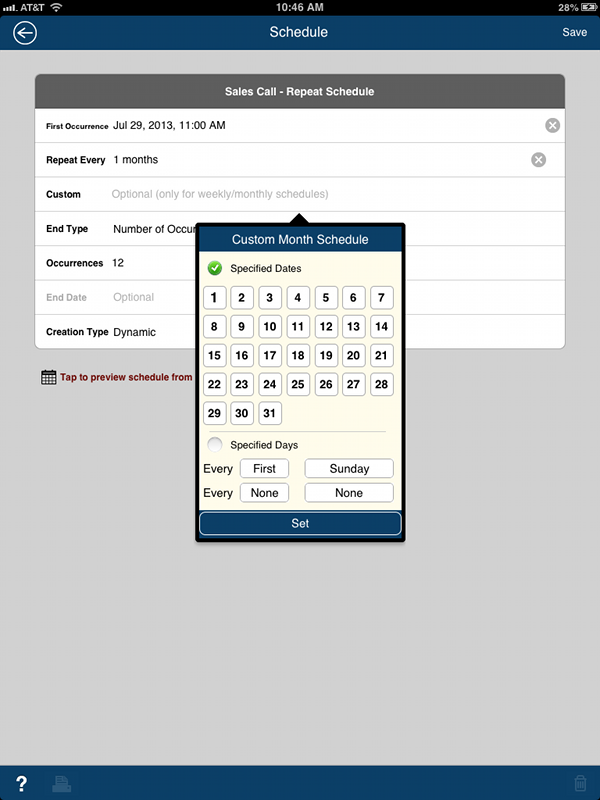 After selecting the month option, you can select specified dates or days on which the appointment or task occurs. This is very useful for events or tasks that are repeated, but occur on varying days. 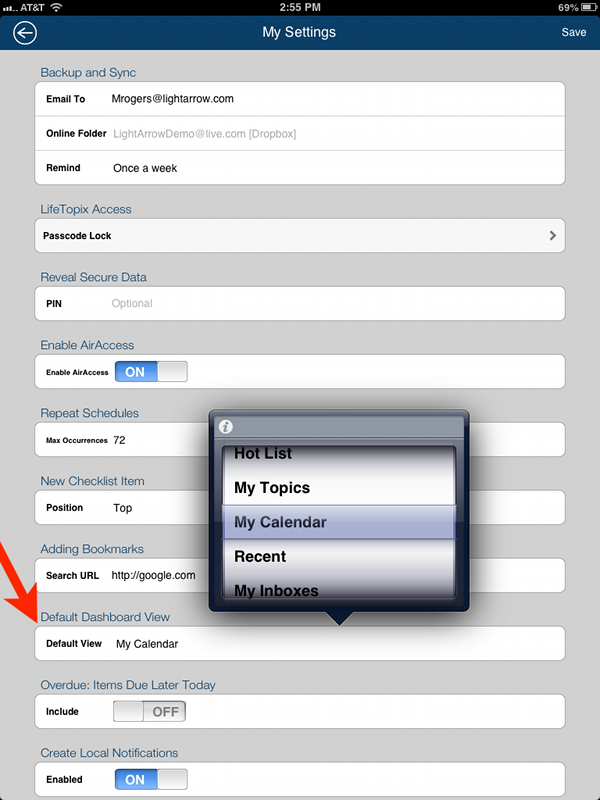 We added a preview for scheduling events, as shown in the image below. 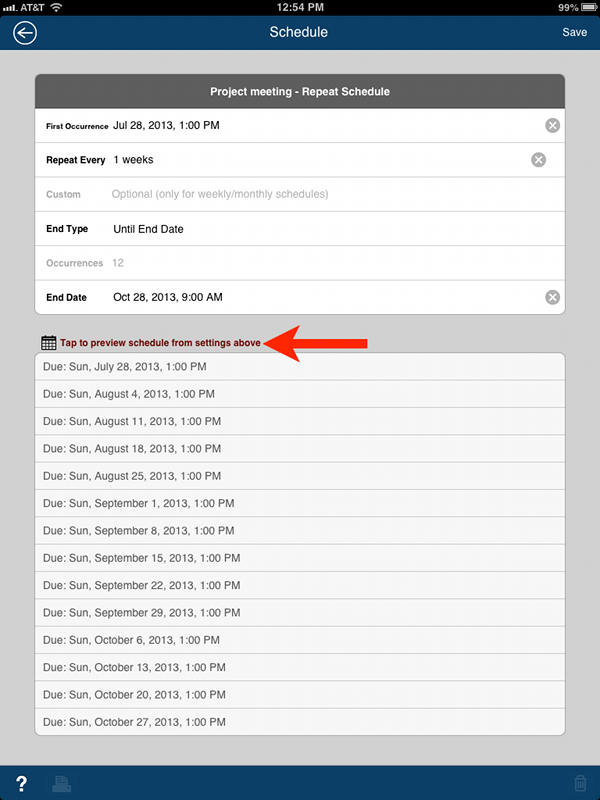 This ensures that you’ve properly set up a recurring appointment, class or meeting. Searching has been improved, our apps now search the content of notes, allowing you to find important information that you’ve added to notes. Also, checklist item titles have been added to search. 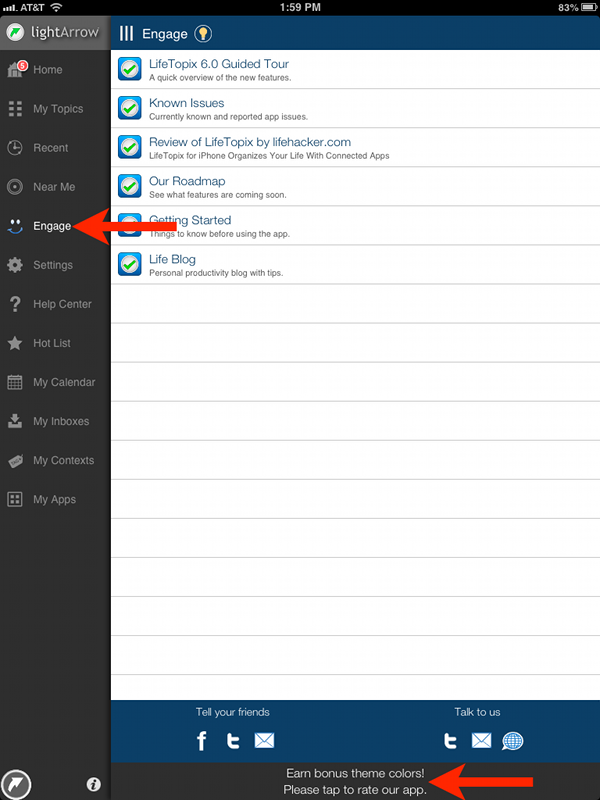 LifeTopix and My.Agenda include integrations for Twitter™, Facebook™, Dropbox™, SkyDrive™, Evernote®, Toodledo®, and Asana™. 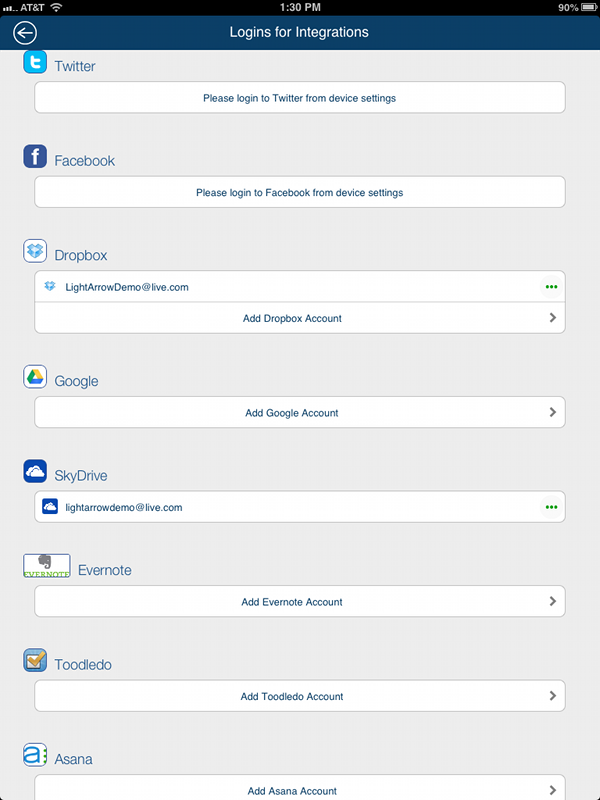 To make it easier to enter your credentials for these apps and services, we’ve included a new view for managing your login name and password. To find the new view, go to Settings and tap Logins for Integrations. The following image shows an example of the new view. The Near Me feature includes significant improvements. You can now set locations for service providers, which allows you to better plan your errands to save time and gas. For example, you might add locations for your favorite dry cleaners, grocery stores, markets, or other providers — and refer to them in the Near Me view so you can make sure to locate the providers that are close to your current area while running errands. You will also notice when you’re specifying locations for providers and other items, that the search has been improved. You now have the option of viewing photos, audio, and video clips in My Calendar. To add or remove the view of these items in your calendar, tap the filter icon in the upper right of the calendar to view the screen shown in the following image. Check the boxes for the items that you wish to view. 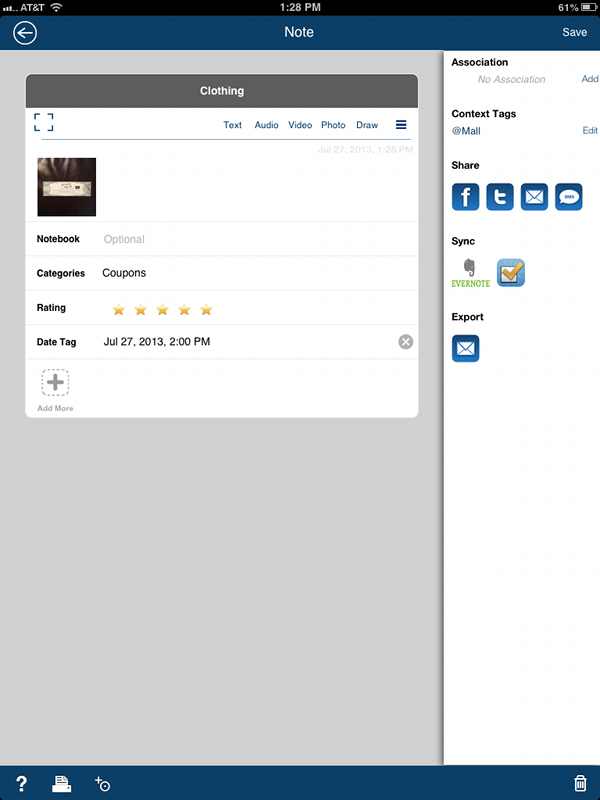 If you create an App Store rating from your LightArrow app, the app will provide you with bonus theme colors. The colors are a surprise; however, the following image shows where to start. When creating a bill payment, you can now enter the paid amount. This is useful to track when the paid amount is different than the amount due. The payment list screen displays the due amount along with the paid amount and the payment template displays the balance. 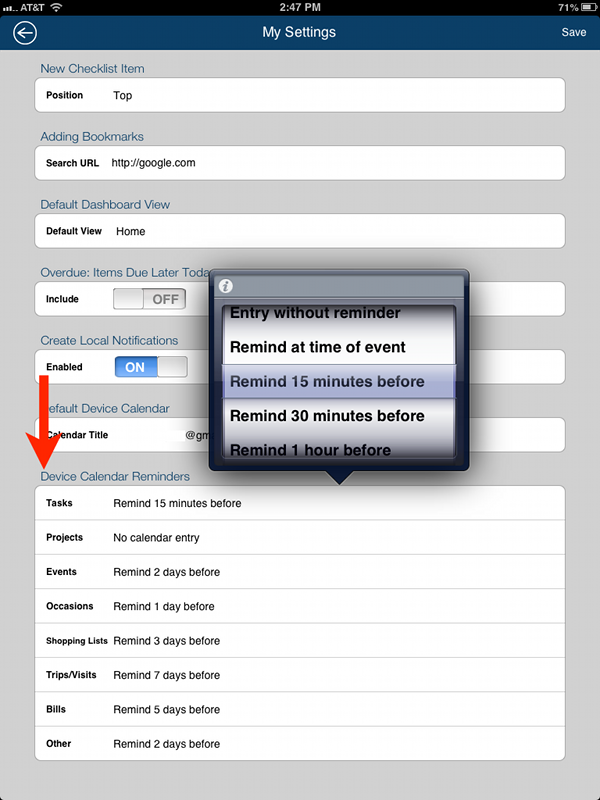 We’ve added the ability for you to convert your device reminders to tasks and shopping items. For example, you might ask Siri to create a reminder for picking up milk to create a device reminder, but this item is better suited as a shopping item. To convert it, tap the icon with the three green dots (or) tap and hold the item to proceed with the conversion. The following image shows an example of converting the item from the Agenda view. The following image shows an example of the new settings. Now you can define the view that is launched at the time of starting your app. You will find this setting in the My Settings view. Keep in mind that this setting only takes effect when the app is first started; therefore, you will need to close LifeTopix or My.Agenda and start it again. The My Apps view allows you to launch other apps from your LifeTopix or My.Agenda app making it easier to launch your favorite apps from one location. You’re now able to reorder these apps as you please by tapping the reorder icon in the upper left, and then dragging and dropping the app into your preferred order. 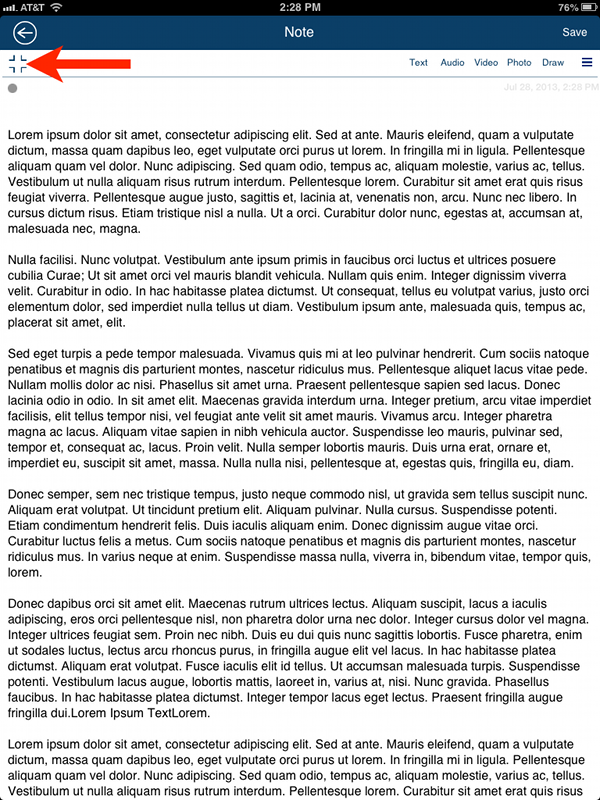 The following image shows an example. Comment field added to shopping items. When viewing the calendar by week, the app autoscrolls to the first item. Checklists now include due dates. We hope this helps you understand how to leverage the new features in LifeTopix 7.0 and My.Agenda 2.0. Enjoy! You guys have the potential for this to be the best app ever made. I have searched, tried, purchased multiple all in one apps….but nothing that is close to yours. There are things I would LOVE see a true mail integration like Postbox or Outlook. And the calendar doesn’t seem to quite be there yet…more updates to come? Our next major update (around the end of January) brings in some amazing improvements, including integration with email and other things. Also, some calendar enhancements coming in this update, and more to come soon after (week and month view enhancements). We need users like you to keep pushing us to be awesome! What is My Inbox used for? 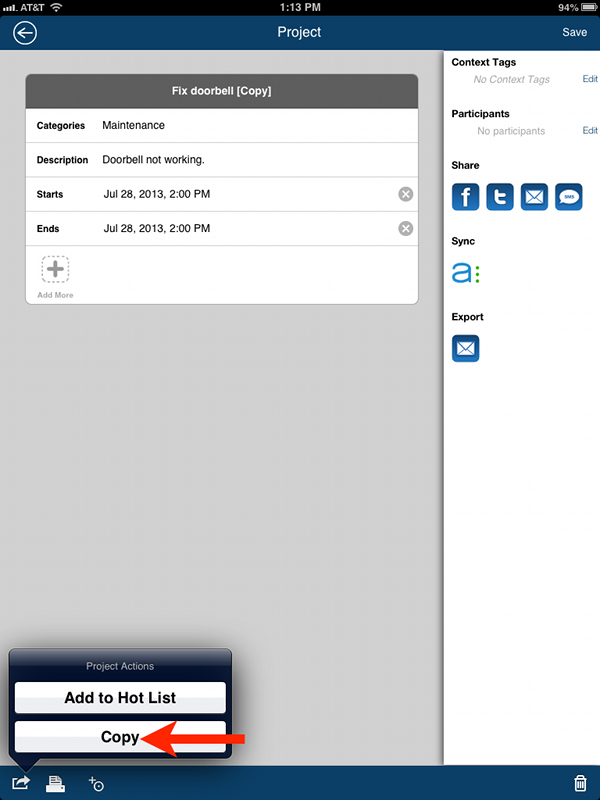 My Inbox is used to quickly add items into our app using the GTD methodolgy. In our next update (targeted for later this month) we have greatly enhanced the this feature and have made it very powerful. With the next update you will be able to your access social media, email and web accounts and intelligently collect information from them and act on it.